I am so excited to finally share the wardrobe I made for my daughters birthday present, a set of Bitty Twins. My sister, found these twins for me for an amazing deal. They were band-new, but they didn't have any clothes. The person selling them had bought them only for their outfits. At first I wasn't worried about them having their original clothes, as long as they had clothes. Then the more I watched my daughter stare at their picture in the catalog, I knew she would be expecting them to come as she saw them. So I did my best to recreate their "meet" outfits. I think I did a pretty good job. I had to make up my own pattern for the shirt, dress, and leggings. I'll be sharing the patterns as soon as I can get them scanned. and the pockets on his jeans. Kate's favorite outfits are the Pajamas. Like a good mama, she likes to put her babies to bed. I also made some matching rag quilts. It was nice to use up some of my fleece scraps. My favorite outfits are their dressy beach clothes. The overalls were much easier than I anticipated. Do you remember these outfits? I love them too. You can see how I made the jacket HERE. Did you notice the shoes? They were a nightmare to make. I made several pairs before I got it kinda right. I'm going to keep playing around with the pattern and make a few more pairs. We are all loving the suitcase I made to store it all in. If you missed it, you can check out my guest post on how I made it HERE. Oh and in case you were wondering, I used the Simplicity pattern #4268 for most of the clothes. What awesome outfits you made! I really love the shoes! The outfits look fantastic! My daughter has a set of bitty twins and I've been trying to make them clothes as well. I can't wait for patterns! Wow, you did an AMAZING job with these outfits! They are all SO cute. I'm sure your daughter absolutely loves them. wow, you are like the coolest mom ever!! Wow! These are so stinkin' cute! I'd say you nailed them, getting them just like the real ones! Great job! Small items like that are so hard to sew, as well! Wow! Such an amazing job!!! You have so much talent. I was impressed when I saw the first set of clothes, but the sets just kept coming! Too cute, and I love the suitcase! the lace dress is fabulous !!! Kalleen, you did a fantastic job. I am inspired! I've been meaning to make clothes for my daughter's dolls. Now to make it more of a priority. What an awesome mom! Those argyle outfits are too cute. Oh My Gosh! You did such an amazing job! What a fun momma your are! Thanks for sharing! WOW!!! What a great birthday gift! I love the clothes - you did such an amazing job!! Can't wait to see the patterns! Great job! All the clothes are so cute! That is amazing. What a labor of love. I bet you were so giddy after it was done. Realy You make memories fot your dauther.. She tells her children how great it was, with her birthday, what her mom made for her.! Great gifts! She will no doubt cherish those baby dolls for years to come--and the personalized doll clothes will become the best part of the memory! Love all the clothes and the suit case to hold the. I also love your daughter strawberry shortcake birthdat hat! I am having a giveaway on my blog. $20 store credit from My Carrie Creations to get a backpack withyour kids favorite disney characters.She also has a strawberry shortcake backpack. All you have to do is leave a comment. these are fantastic Kalleen! Great job re-creating the first outfits! and i love all the other ones too...those shoes are adorable! very cut set of twins, with an amazing wardrobe, I especially like the beach ensemble. Such wonderful work, and what a great (and cute!) storage idea. I'm just beginning to dabble in making American Girl doll clothes. You're such an inspiration! Super cute. Will you maike some for Audj? he pictures show how much she loves them! Great job!! I haven't been able to 'wow' my son just yet. These are adorable!! 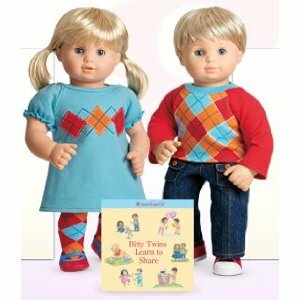 My younger sisters have AG dolls and Bitty Twins, and they are wondering if you ever got around to posting your patterns? Can I just say that your creations are AMAZING! Well done on recreating their "meet" outfits - stunning. Off to check if you scanned the patterns as I have to make clothes for my niece's bitty twins for her Birthday!